Cardington-Lincoln High School Homecoming king, queen and attendants.Back row: from left: Mikaela Osborne, sophomore attendant; Ashleigh Morales, junior attendant; Delisa Goodman,senior, queen candidate; Paige Clinger, senior, queen candidate; Kynlee Edwards, senior queen candidate and Brooklyn Clapham, freshman attendant front row: king candidates, all seniors: Dylan Goodman, Deven Speck and Branden Steckel. Cardington-Lincoln Junior Homecoming court, from left, all first grade students: Abbey Branham, Lily Moodispaugh and Branson Naylor. Cardington-Lincoln High School will observe its 72nd Homecoming on Friday, Oct. 5. The Cardington Pirates will host the Danville High School football team. Kicking off the celebration will be a parade that will take place Wednesday, Oct. 3, beginning at 6 p.m. at the high school. The parade will follow a route through the village streets and back to the high school where a bonfire will be held. The Homecoming ceremony will be held at 6:30 pm Oct. 5, prior to the kick off of the football game. Attendants are Ashleigh Morales, junior; Mikaela Osborne, sophomore and Brooklyn Clapham, freshman. Daniel Kill and Katelyn Denney, 2017 homecoming king and queen will crown the new royal couple. A dance will be held following the football game until 11:30 p.m. Admission is $4. John Brehm will serve as DJ. Clinger, 17, is the daughter of Matt and Molly Clinger. She will be escorted by King Candidate, Dylan Goodman. Clinger’s activities include varsity volleyball, basketball and softball, FFA FCA, Spanish Club, NHS, Marching band, Spirit Club and the Shawcreek Farmers 4-Club. She has earned honorable mention All-league and disrict for volleyball and honorable mention and All-League and district in basketball and achieved her state FFA Degree. Edwards, 18, is the daughter of Jamie and Charity Edwards. She is active in AAU basketball, FCCLA, Spanish Club and varsity basketball. She has won a district letter in Cross Country, is a Archie Griffin recipient, All-Ohio Honorable mention; two time first team All Central District; two time first team All District 11; second team All Central District; 2nd Team All District 11; three time All Conference Selection, varsity basketball captain, three year varsity basketball letter winner and two time defensive player of the year. She has accepted a full athletic scholarship to play basketball at the University of Findlay. She will be escorted by Branden Steckel. champion high point member in 2018. She received her state degree in 2018. King candidate Goodman, 17, is the son of Lynn and Diane Goodman. He is active with varsity basketball, and is the current FFA vice president. He is also the vice president of the Shaw Creek Farmers 4-H Club, belongs to student council, National Honor Society, president of the Fellowship of Christian Athletes and is assisting minister and acolyte at St. Paul Evangelical Lutheran Church. He was the top FFA Soil Judge and received his state degree in 2015. He played basketball in 2018 and received the Pirate award and Honorable Mention in the KMAC. and he is a varsity football and wrestling letterman. He won the Grand and Reserve Champion Market Rabbit in 2015 and 2016. Steckel, 18, is the son of Denise Radcliffe and Brad Steckel. He is a member of the FFA, NHS and plays football and basketball. He has earned honorable mention during his freshman and sophomore years for kicking in football ,was named second team KMAC Kicking his junior year and earned the Archie Griffin Award. Morales, 16, a junior, is the daughter of Armando and Katherine Morales. She is a varsity cheerleader for football and basketball, belongs to FCA, the Spanish Club, the Fresh Faith Youth Group and the Spirit Club She has earned a varsity letter in cheer. She will be escorted by Tristan Nichols, son of Jenna Nichols and J. D. Nichols. Osborne, 15, is the daughter of Crissy Branson and Mike Osborne and granddaughter of Sharon and Ernest Osborne. She will be escorted by Noah Struck, son of Sara and Mike Struck. She is involved with FFA and serving this year as secretary with the FCCLA and as her class secretary. She has earned her Greenhand degree and served on the Novice team last year that made third in the state. Clapham, 14, is the daughter of Jason and Heather Clapham. She belongs to FFA, FCCLA, 4-H, is a cheerleader and is on the YEDA Equestrian Team. She is the 2018 Junior Horse Queen at the Morrow County Fair and won the FFA Star Discovery Award in the eighth grade. She will be escorted by Nathan Hickman, son of Dave and Sarah Hickman. All homecoming activities are sponsored by the Spirit Club and Student Council. 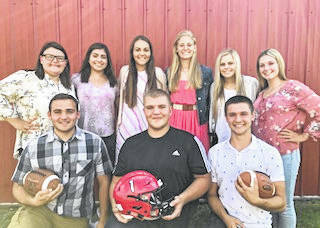 https://www.morrowcountysentinel.com/wp-content/uploads/sites/29/2018/09/web1_Cardington-Lincoln-Homecoming-king-and-queen-2018.jpgCardington-Lincoln High School Homecoming king, queen and attendants.Back row: from left: Mikaela Osborne, sophomore attendant; Ashleigh Morales, junior attendant; Delisa Goodman,senior, queen candidate; Paige Clinger, senior, queen candidate; Kynlee Edwards, senior queen candidate and Brooklyn Clapham, freshman attendant front row: king candidates, all seniors: Dylan Goodman, Deven Speck and Branden Steckel. 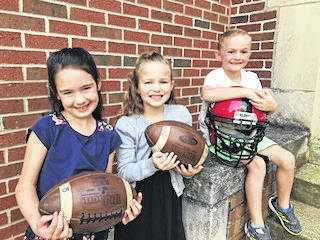 https://www.morrowcountysentinel.com/wp-content/uploads/sites/29/2018/09/web1_junior-court-football-2018.jpgCardington-Lincoln Junior Homecoming court, from left, all first grade students: Abbey Branham, Lily Moodispaugh and Branson Naylor.